communications to develop their chirp sounder. 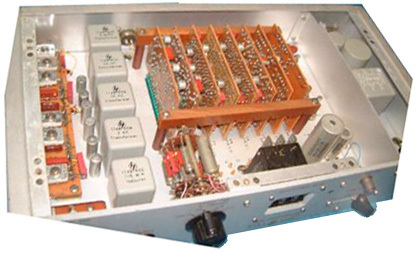 A 60 kHz WWVB receiver with a phase comparison to an external 100 kHz signal both meter and paper strip. Takes a standard frequency input and divides it down to 1 PPS and drives an analog clock running on a 1 kHz motor, very noisy. More T&F equipment in another rack.